I realized a few nights ago that posting about interviews for my next job, without mentioning this past summer, might have given the wrong impression about Red Hat- that I didn’t enjoy it, so I was interviewing elsewhere, or something along those lines. So here goes a quick clarification. 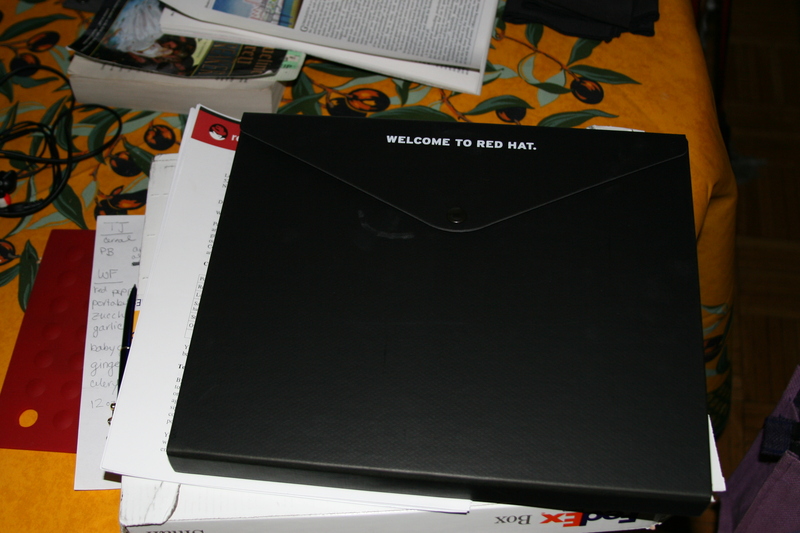 I really, really enjoyed working at Red Hat- I got to work with great people on great projects that were interesting and that took good advantage of my skills and background, and you can’t ask much more than that. And it wasn’t just that it was good for me- after a summer there, I think very highly of the company. It isn’t perfect- no company is- but it genuinely seems to try hard to walk the walk, and I like that. I would recommend it to friends- which is about the highest praise you can give a company. So I made the right call deciding to go to Red Hat, I think it is a good place to work overall, and I’d certainly consider going back at some point. But right now there seems to be a strong consensus among all the lawyers I’ve spoken to (including the ones at Red Hat) that I should go work at a firm, so that I can learn more about what it means to be a lawyer- the skills, the lingo, the shared experience, so on. And I’m pretty intrigued by the greater variety of cases and broader resources that you can draw upon in a big firm- I can definitely see myself enjoying that aspect of firm life. I know everyone enjoyed your time in NC mate. So good luck Luis, your determination has me in awe. Legal ninja’s who care about the code like you do are far too rare. We’ve got a light on for you when you complete your plans!